When Will I Get My Single Sheet Newsletters? 500 to 5,000 No Fold Newsletter: Ships or ready for pick up in 2 business days from proof approval. Under 500 No Fold Newsletter (printed digitally): Ships or ready for pick up in 1 business day from proof approval; UV coating requires 1 additional day. Over 5,000 No Fold Newsletter: Ships or ready for pick up in 5 business days from proof approval. Single sheet newsletter printing shows off high-impact messaging. There’s no way around it -- newsletters are a great way to communicate with customers, prospects or members! When you take advantage of our easy-to-use online newsletter printing at 48HourPrint.com, you receive high quality newsletter printing at very affordable prices. And you also get the benefit of our industry-leading 48 Hour Turnaround Time Guarantee for quantities of 5,000 or fewer. 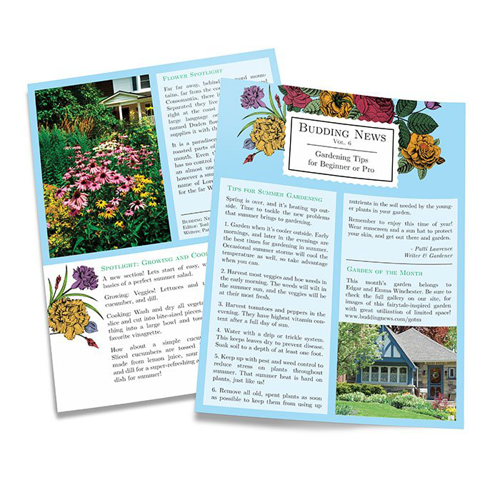 Single sheet newsletter printing lets every message get immediate attention. Whether you choose to print full-color messaging and visuals on one side or two sides, single sheet newsletters give you the impact of an oversize postcard but with room for more details. This allows you to quickly let people know about new products and services or share exciting news. In addition to our single sheet newsletter printing services, you can also choose from single fold newsletter printing, tri-fold newsletter printing, double parallel fold newsletter printing, accordion fold newsletter printing, french fold newsletter printing, roll fold newsletter printing and gate fold newsletter printing. We have newsletters covered! Review our newsletter printing for layout guidelines that will help keep your print job on schedule.